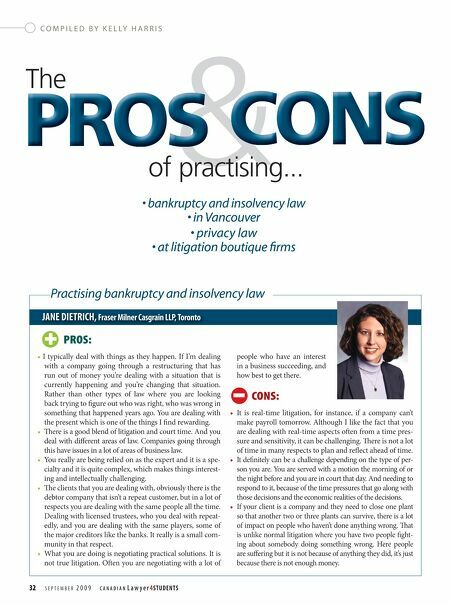 COMPILED BY KELLY HARRIS PROS CONS The of practising... • bankruptcy and insolvency law • in Vancouver & • privacy law • at litigation boutique fi rms JANE DIETRICH, Fraser Milner Casgrain LLP, Toronto + Practising bankruptcy and insolvency law PROS: • I typically deal with things as they happen. If I'm dealing with a company going through a restructuring that has run out of money you're dealing with a situation that is currently happening and you're changing that situation. Rather than other types of law where you are looking back trying to fi gure out who was right, who was wrong in something that happened years ago. You are dealing with the present which is one of the things I fi nd rewarding. • Th ere is a good blend of litigation and court time. And you deal with diff erent areas of law. 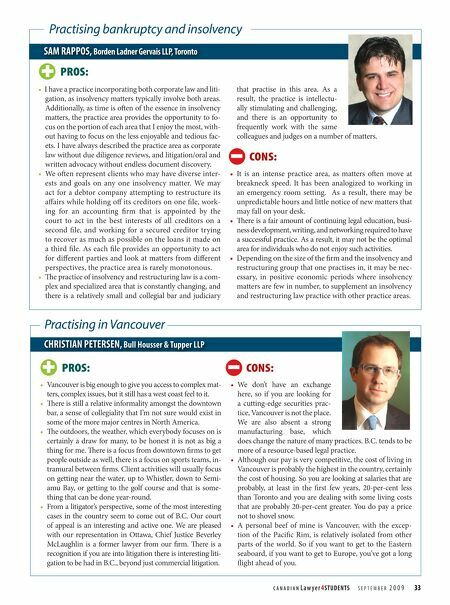 Companies going through this have issues in a lot of areas of business law. • You really are being relied on as the expert and it is a spe- cialty and it is quite complex, which makes things interest- ing and intellectually challenging. • Th e clients that you are dealing with, obviously there is the debtor company that isn't a repeat customer, but in a lot of respects you are dealing with the same people all the time. Dealing with licensed trustees, who you deal with repeat- edly, and you are dealing with the same players, some of the major creditors like the banks. It really is a small com- munity in that respect. • What you are doing is negotiating practical solutions. It is not true litigation. Oſt en you are negotiating with a lot of 32 SEPTEMBER 2009 C ANADIAN Lawy er 4STUDENTS people who have an interest in a business succeeding, and how best to get there. - CONS: • It is real-time litigation, for instance, if a company can't make payroll tomorrow. Although I like the fact that you are dealing with real-time aspects oſt en from a time pres- sure and sensitivity, it can be challenging. Th ere is not a lot of time in many respects to plan and refl ect ahead of time. • It defi nitely can be a challenge depending on the type of per- son you are. You are served with a motion the morning of or the night before and you are in court that day. And needing to respond to it, because of the time pressures that go along with those decisions and the economic realities of the decisions. • If your client is a company and they need to close one plant so that another two or three plants can survive, there is a lot of impact on people who haven't done anything wrong. Th at is unlike normal litigation where you have two people fi ght- ing about somebody doing something wrong. Here people are suff ering but it is not because of anything they did, it's just because there is not enough money.